On behalf of Freemasons Queensland, Australia, I have great pleasure in inviting you to attend the Grand Installation of RW Bro Paul Holland, DGM and Grand Master-elect. The celebrations will begin with a Meet & Greet Function, on Friday, 5th July 2019 and conclude with a Farewell Luncheon on Sunday, 7th July 2019. Please find more information about these events and how to buy tickets on our Eventbrite page. 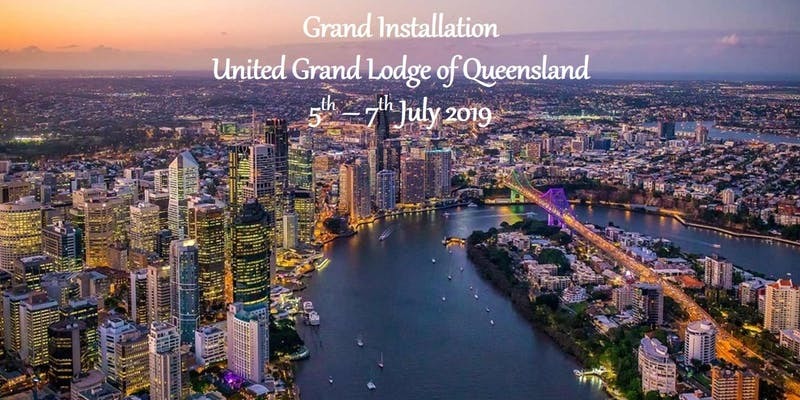 Qualified Members of the United Grand Lodge of Queensland are invited to the March 2019 Quarterly Communication of the United Grand Lodge of Antient Free and Accepted Masons of Queensland. 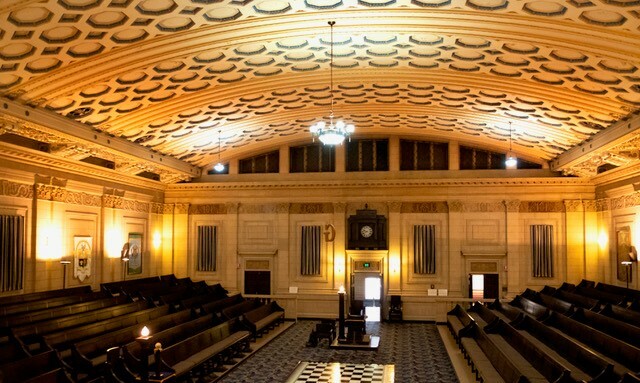 The QC will be held at the Masonic Memorial Centre, 311 Ann Street Brisbane on Wednesday 6 March 2019 commencing at 7:30 pm. Attendees are requested to be seated in Grand Hall no later that 7:15 pm. Please note if you do not purchase a ticket beforehand on our Eventbrite page you cannot attend. the December Quarterly Communication will be held Wednesday 5 December 2018 at the Masonic Memorial Centre, Ann Street, Brisbane. Members are requested to be seated by 7:15pm for a 7:30pm start. The Ladies Dinner will be held concurrently. Ladies are requested to be seated by 7:00pm for a 7:15pm start in Supper Room 2 on level 2 of the Masonic Memorial Centre. The Ladie's Dinner Invitation is in the Member Materials section of the website, or here. 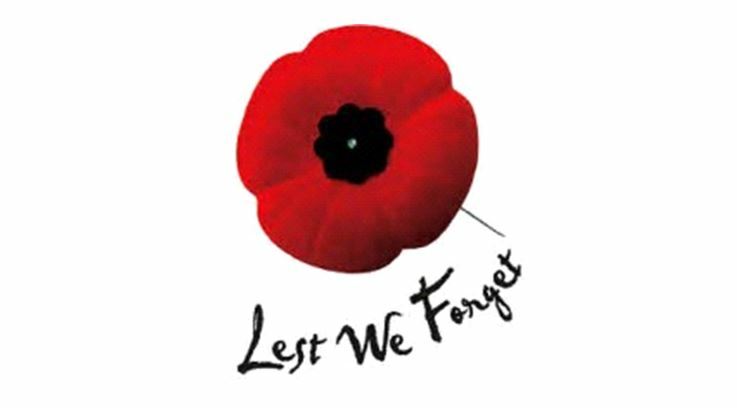 In November please come to a Remembrance Day Ceremony at Townsville Masonic Centre. 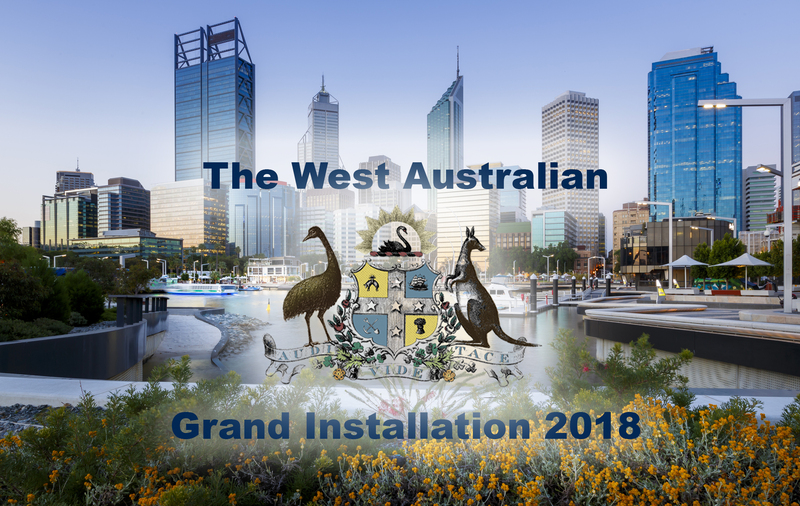 The Grand Lodge of Western Australia extends a cordial invitation to attend the Grand Installation of the Grand Master Elect, RW Bro Peter Kirwan, Deputy Grand Master in the Grand Ball Room of the Hyatt Regency Hotel, Perth at 6:00pm on Friday 26 October 2018. The ceremony will be attended by Grand Masters, their ladies, partners and delegations from the Australian and New Zealand Grand Lodges together with several Grand Lodges from the Indian Ocean region. Freemasons from all over Western Australia will join this event. This special occasion is also open to non-freemasons and are invited to attend the full traditional installation ceremony. There will be a variety of events organised for the weekend, where you can look forward to making new friendships and strengthening old ones. Your host Lodge for this Gathering of the Clans (GOTC) 2018 is Southport Lodge No 62 UGLQ. Coincidentally it will be 20 years since we last hosted it and we are looking forward to making it a great event. Meet and Greet on Level 21 for introductions, drinks and chit chat then dinner in a restaurant at RACV Royal Pines. Costs to be borne by individual attendees. Benowa Ballroom 1st Degree Ceremony ( only for Freemasons) followed by a demonstration of “The Auld Scots Degree”. Ladies High Tea on Level 21 Cost $36 per head (payment via the GOTC 2018 website booking page. Those Ladies that are wanting champers pay individually direct to RACV on the day). Saturday Evening 29/9/2018 at 6-30 PM FOR 7-00 PM (Drinks available at the bar located outside the Grand Ballroom from 6-30 pm) Gala Banquet in Grand Ballroom. “Authentic and Very Serious Address to the Haggiss”, entrée of Haggiss, Tatties and Neeps, Main course of alternate drop meals and desserts of alternate drop followed by tea and coffee. 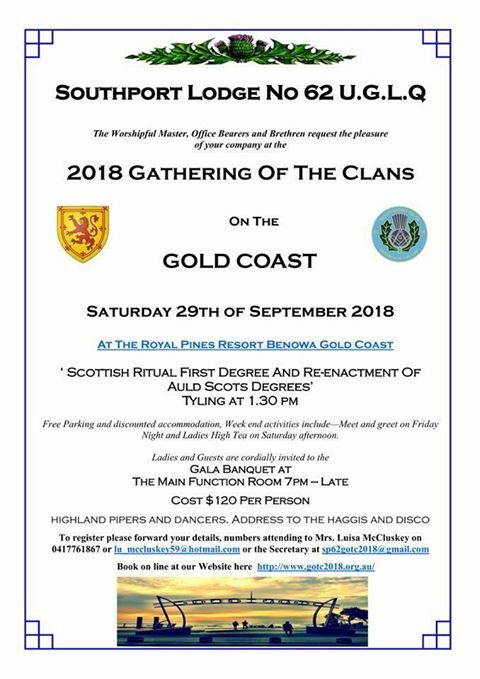 Cost is $120 per head (Payment via the GOTC 2018 website booking page) with attendees responsible for their own drinks, bar prices are very reasonable.. We will have entertainment featuring Scottish Pipers, Scottish Highland Dancers and a Professional DJ. We have chosen The Sanctuary as our nominated not for profit charitable organisation for our fundraising efforts for GOTC 2018. It is a local Gold Coast organisation that provides refuge and assistance to woman and children who have been subjected to domestic violence. 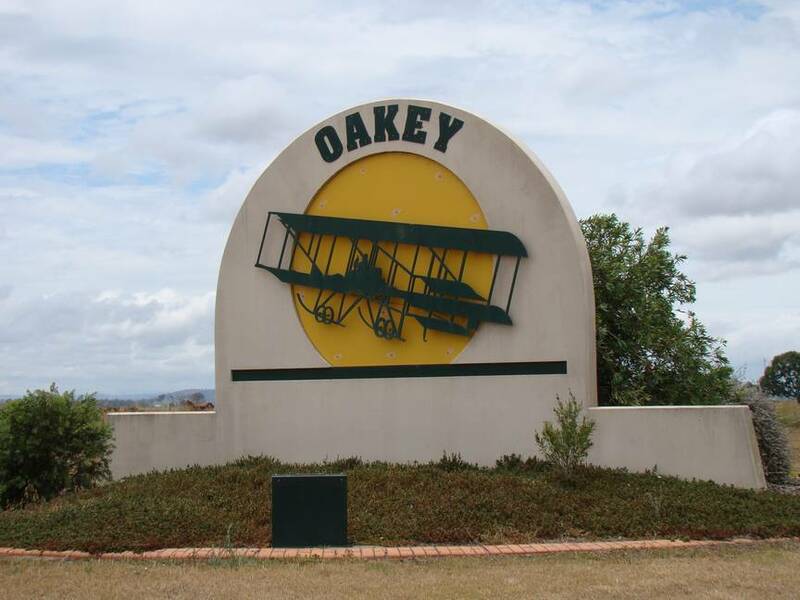 The September Quarterly Communication will be held on Saturday 8 September 2018 at the Oakey Cultural Centre, Cnr McDonald & Campbell Streets, Oakey 4401. If you are attending, you will need to send in the Registration Form to membership@uglq.org.au by 1 September 2018. We extend to Queensland Freemasons and their partners and ladies a cordial invitation to attend the Grand Proclamation, Winter Quarterly Communication and associated ladies’ afternoon tea at the Masonic Memorial Centre, 311 Ann Street, Brisbane on Saturday 7 July 2018. The ceremony will consist of the proclamation of our current Grand Master Most Worshipful Brother Alan Maurice Townson and our Deputy Grand Master Right Worshipful Brother Paul Andrew Holland, and the investiture of our new Assistant Grand Master Right Worshipful Brother Campbell Denyer and Grand Officers. If you wish to attend the Grand Proclamation banquet, please download and complete the registration form, then save and return it to membership@uglq.org.au by Friday 22 June 2018. This year, the Winter Quarterly Communication will be held prior to the Grand Proclamation on Saturday 7 July. A ladies’ afternoon tea will be held in Supper Room 2 from 2-4pm during the Quarterly Communication. Raphael Lodge presented their Peter & Joan Pascoe Raphael Lodge Masonic Bursary to five worthy recipients. This was the lodge’s 16th annual presentation, with Raphael Lodge now having assisted 75 students in total, most years with a grant of $2000 to each student to help further their studies. The bursary is made possible due to the generosity of Mrs Joan Pascoe & the late Bro Peter Pascoe of Raphael Lodge. Families with young children with disabilities on many occasions struggle to cope with the constant care that is required to support the child in their everyday living. The child can become lonely and bored while the family becomes exhausted and despondent. 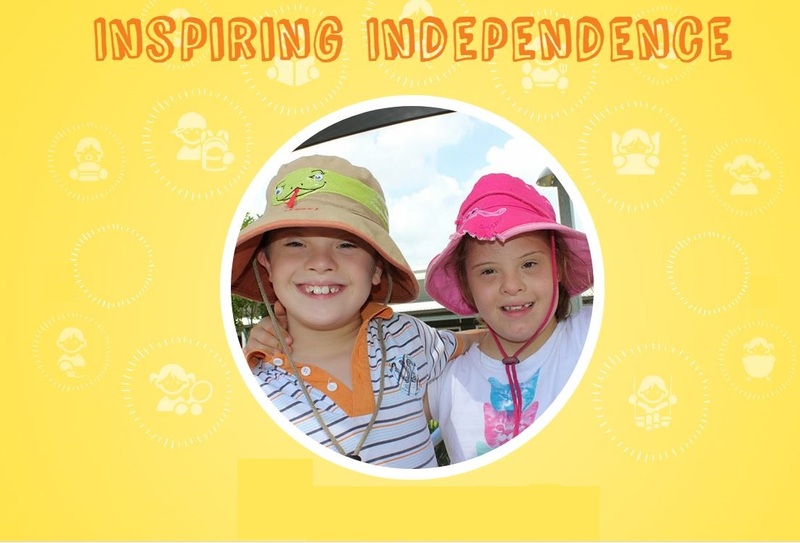 BestLife Foundation makes it possible for children with disabilities to build a more independent future. With the support of BestLife they can make friends, build networks and become more independent, benefiting from opportunities to be away from home. A high level of organisation is required and specialised care essential to achieve the desired outcomes. Understandably, it is expensive. BestLife provides high level away-from-home experiences for children who live with a disability from 6 to 19 years of age. This includes sleepovers in a purpose-built house within the grounds of Mackenzie Special School. The children are overseen by paid education and healthcare professionals. Every effort is made to match the children by age, interests and ability. At the sleepover, the children can play, share meals (which they help prepare), watch a movie, laugh, sleep and interact with others. Not all children are up to a sleepover so BestLife also offers daytime programs. In many cases, the children experience their first taste of independence through these expeditions. BestLife was founded in 2013 by families of young people living with disability. It’s management is largely run by volunteers. However, money is required to train teachers, healthcare and allied professionals to provide the high-level support needed for the children. Funding is also required to hire the venue, provide food and resource materials, etc. A lack of government funding in this area severely restricts the number of children who can be accommodated in the various programs and the ability of the programs to operate successfully. Dunellan Lodge set about fundraising to support BestLife in its programs and believe any assistance that can aid our children with a disability is a valuable and much needed contribution to this specific section of our community. Dunellan Lodge applaud BestLife for the dedication and work it is undertaking to help make a better life for the families and children placed in this situation. 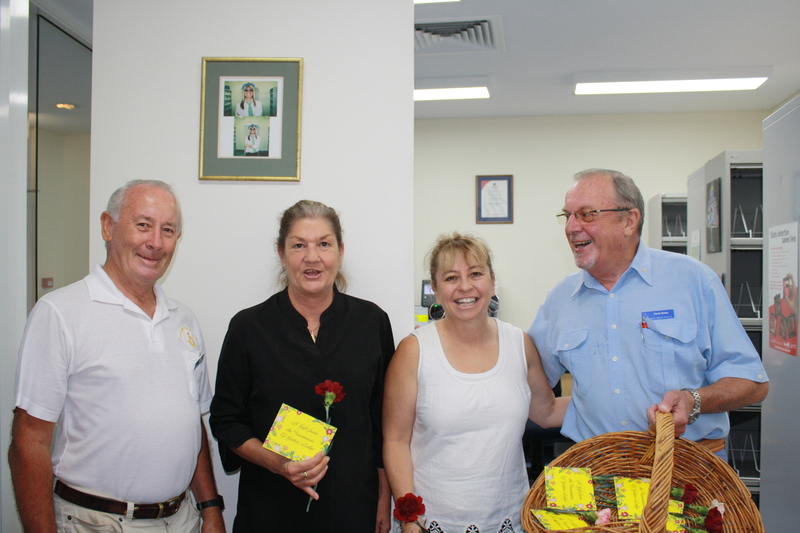 The Lodge raised $600, and with the valuable assistance of Hand Heart Pocket the Charity of Freemasons Queensland dollar-for-dollar scheme, four children with disability were able to be covered by the program from the $1200 contribution. Dunellan Lodge is proud to be associated with Hand Heart Pocket and BestLife in supporting families and children with disability. As President of the Australian Medical Association Queensland, Queensland Freemason and columnist for our quarterly magazine, Dr Bill Boyd had a chance meeting. “I had the privilege of meeting Dr Wylie Gibbons and his wife Erica at a special presentation,” he said. 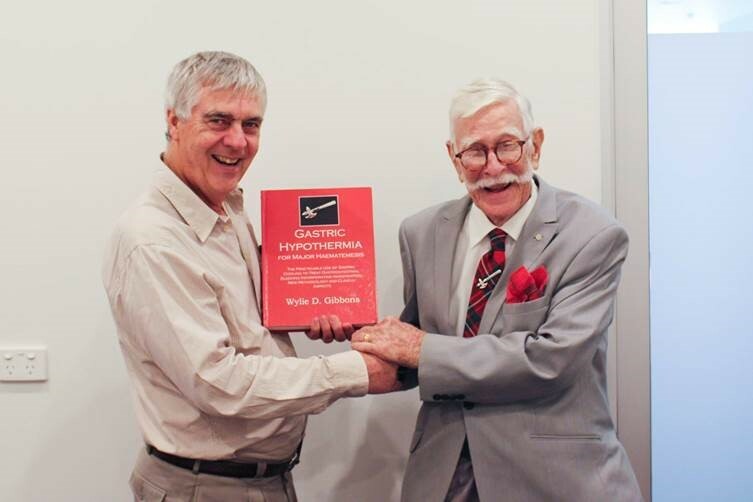 The AMA Queensland presented Dr Gibbons with a bound copy of his impressive scientific work on Gastric hypothermia as a treatment for catastrophic bleeding. Dr Gibbons wore a Royal Order of Scotland lapel pin. He celebrated his 90th birthday in January. Looking to do something for their community, Dalby United Lodge No 180 chose to contribute to Karingal Nursing Home. Secretary of the Lodge, Wor Bro David Wheelehen’s wife works at the nursing home, so the lodge asked what they really needed. The Home gave them a list of options, and the Lodge decided two recliner chairs would be most valuable, raising funds through a local cent sale auction and tickets, giving away fun prizes. The recliners chosen are transportable, with wheels that allow nurses to collect less-mobile residents from their rooms and move them to the common areas. They have special pressure points and a generous amount of foam to help make residents comfortable. The recliners are made in Queensland and while manufacturing took some time, as they are in high demand, the wait was worth it. 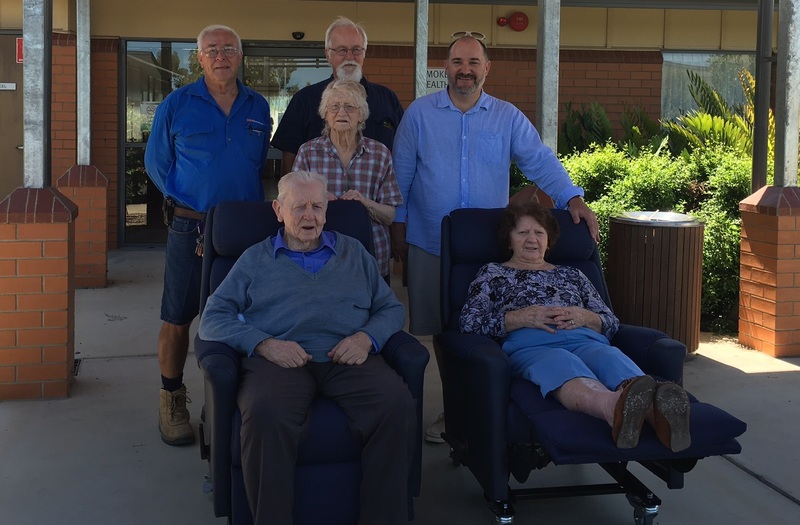 With a dollar-for-dollar subsidy from Hand Heart Pocket the Charity of Freemasons Queensland, they were able to present two recliners, valued at $2190 each. Representatives Wor Bro David Wheelehen, Wor Bro Jeffrey Parkes and VW Bro Peter Horn attended the presentation. The Consecration of Bennu Lodge 538 on 29 October 2016 brought Sunnybank and William McLeod Lodges together. The Lodge was pleased to celebrate their one-year anniversary in October last year. Work continues to strengthen their position in the coming year, with two new candidates in the wind. As a new Lodge under the UGLQ banner, they are proud of the Bennu Project, what the two combined lodges have achieved as one. They have been delighted that The Gulf Lodge No 539 is now the newest Lodge on the role of the UGLQ, where both Sir William Wallace and Norman Lodges decided to follow the Bennu Lodge model—not just by merging, but by creating a brand new lodge. They will continue with their “traditionally modern” approach to membership and Freemasonry, and continue to grow. 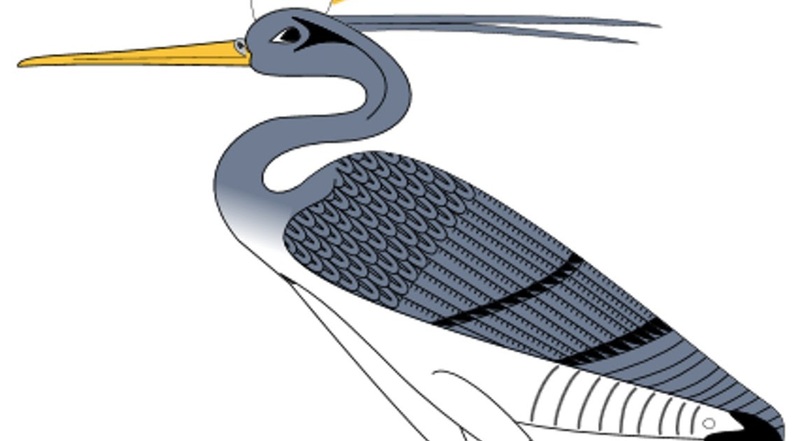 The Bennu bird is the mythological Phoenix of Egypt; it is the allegory or archetype of transformation and renewal, of creation and of life. The Bennu is emblematic of the strategy behind this project – creating vibrant and viable Lodges via transformation and renewal. The creation of a life as out of the ashes came Passion, Purpose and Pride. 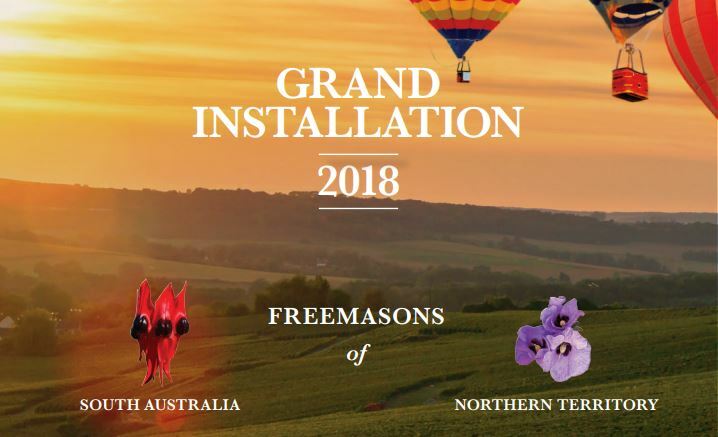 Freemasons are invited to register and attend the 2018 Grand Installation of Freemasons South Australia & Northern Territory on Friday 20 – Sunday 22 April 2018. Jenny and I have the pleasure to extend (on behalf of all Freemasons in South Australia and the Northern Territory), our very warm invitation to all Freemasons, their partners, families and friends to join us in celebrating the Grand Installation of RW Bro Dr Neil Jensen as the 35th Grand Master of the Grand Lodge of South Australia and the Northern Territory together with RW Bro Arnie Narayan as Deputy Grand Master and RW Bro Robert Clyne OAM as Assistant Grand Master. This important event will be held at the Adelaide Entertainment Centre on Saturday 21st April. Please refer to the program guide below for a listing of all associated functions that have been purposely designed to heighten our enjoyment of each other’s company, enrich the ties we have with existing friends and open opportunities for us to make new friends in surroundings that radiate welcome. We will all look forward to welcoming you and ensuring that your stay with us will leave you with warm and unforgettable memories. To view the programme of events and to register, access the full brochure on their website. Please be advised the UGLQ business office will close at 1pm on Friday 22nd December and will reopen on Monday 8 January 2018. DGLNQ – Closes 18 December 2017, reopens 8 January 2018. Royal Arch – Closes Tuesday 19 December 3pm, reopens 15 January 2018. The DGLCA Office will reopen in the New Year at the Freshwater Masonic Centre, 90 Old Smithfield Road, Freshwater. Business hours will be Tuesday and Thursday 9.30am–12.30pm. Their new contact number is 0488 512 712. We wish you and your families all a very Merry Chistmas and a Happy New Year. Ashton Lodge held their installation and on this special occasion, the Grand Master MW Bro Alan Townson presented five-bar Lewis jewels to twins, Bros John and Andrew Casper, as well as a two-bar Lewis jewel to Wor Bro Hamish Kerr. 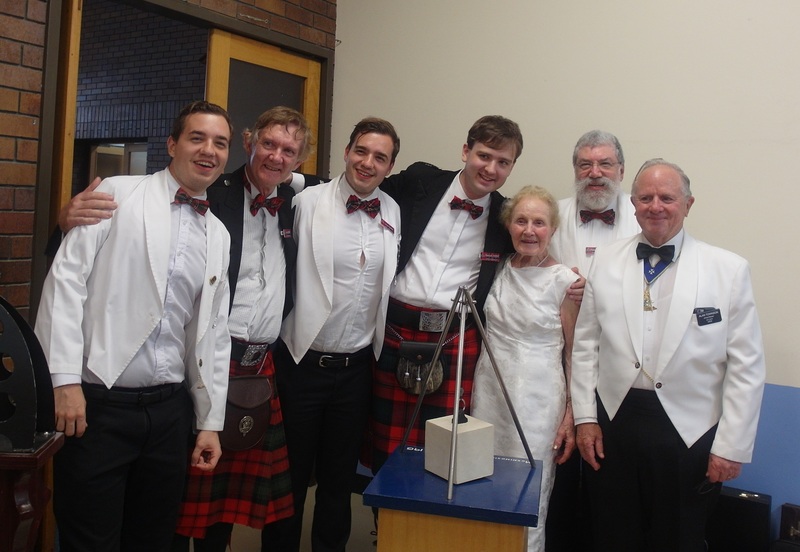 This was a memorable day for Hamish as, at just twenty-five years of age, he was installed as Master. Interestingly, Hamish, John and Andrew are cousins. Mrs Marie Casper, grandmother to John, Andrew and Hamish, flew up from Melbourne for the weekend. Ashton Lodge’s installation was a big success with Hamish and officers installed by the attending Grand Lodge team, which consisted of the Grand Master, Deputy Grand Master, two Past Grand Masters and fourteen Grand Officers. There were nearly 120 brethren at the ceremony and 160 at the banquet with 17 Masters present. 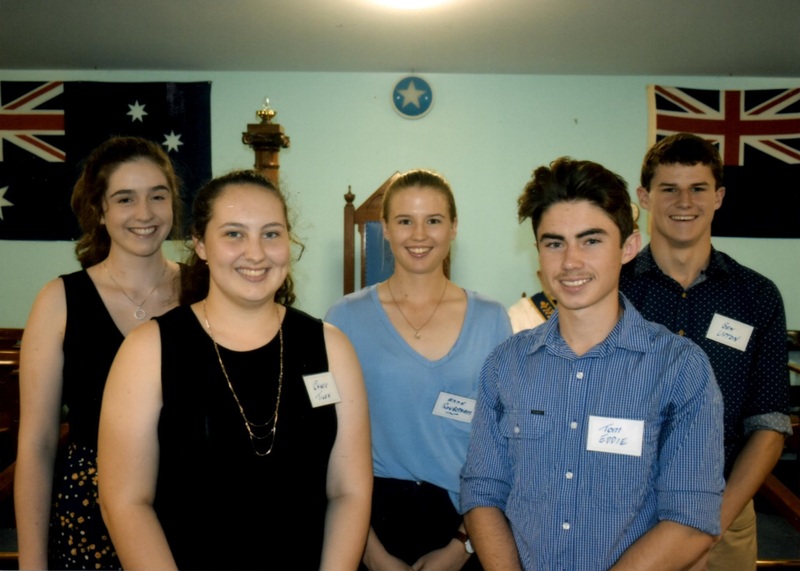 Gympie Lodge celebrated its 150-year anniversary (its sesquicentennial!) in October, around the same time we celebrate the 300th anniversary of the United Grand Lodge of England. Gympie, originally called Nashville, was established in 1867. 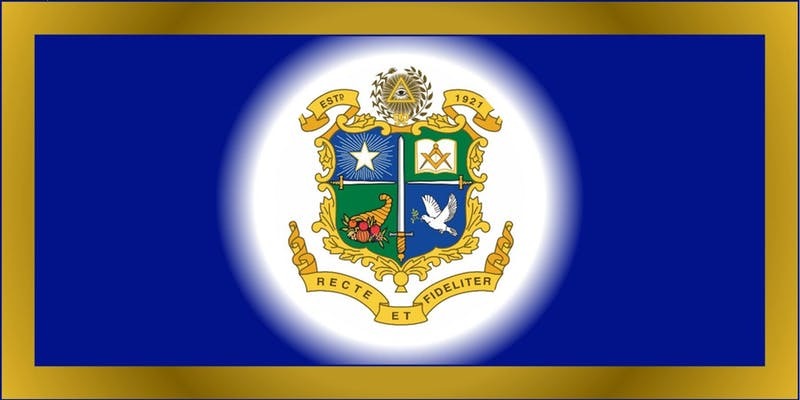 Just two years after this, the first lodge, Nashville Lodge (now called Pioneer Lodge), was established on 24 March 1869 under the United Grand Lodge of England. The first Master of the lodge was Edward Henry King who was also the first Gympie Goldfield Commissioner. The inaugural meeting was attended by the District Grand Master, Sir Augustus Charles Gregory, Queensland’s first Commissioner for Crown Lands and Surveyor General. The original lodge building on Duke Street was completed in time for the inaugural meeting of Nashville Lodge in 1869 and still stands today. It is one of Gympie’s oldest surviving buildings from the Gold Rush days. As Freemasonry in Gympie expanded, the premises at Duke Street became too small and in 1901, our current lodge building on Channon Street was built for £1,170 pounds ($172 658 in today’s currency). Since the establishment of Nashville Lodge (now Pioneer), a number of additional lodges have been formed in Gympie and the surrounding districts. Prince Leopold Lodge was formed in 1885 under the United Grand Lodge of England. This was followed by Lord Dufferin Lodge in 1886 under the Grand Lodge of Ireland. 1894 saw the establishment of Braemar Lodge under the Grand Lodge of Scotland, followed in 1897 by Gympie Lodge (now closed), also under the Grand Lodge of Scotland. Kilkivan Lodge was established in 1901 under the Grand Lodge of England. In 1921, the United Grand Lodge of Queensland was formed and all the existing lodges joined under the banner of the new Grand Lodge. In 1922, Telford Lodge at Imbil was the first local lodge established under the United Grand Lodge of Queensland, followed by Gympie Temperance Lodge (now closed) in 1925. In 1928 Kin Kin Lodge was established, followed by Woolooga Lodge in 1929, Theebine Lodge in 1948 and the youngest lodge, Cooloola, in 1988, which closed in 2014. Little Kids Big Day Out. In addition, a number of lodges provide ongoing support to their local schools through awards and other donations. Gympie and District Freemasons entered a float in the Gold Rush parade which celebrated the discovery of Gold in Gympie in 1867. 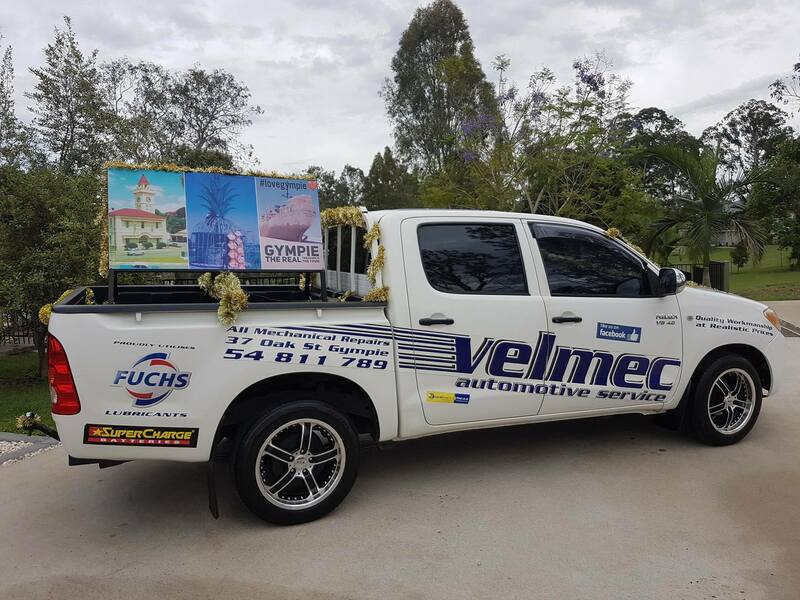 On 14 October 2017, Freemasons from as far afield as Cooroy, marched in the Gold Rush Parade in full Masonic regalia behind the UGLQ vehicle which was kindly driven by the Grand Secretary, RW Bro Ian Tomlinson. Despite the inclement weather, 26 brethren participated from nine lodges in the Gympie District. Feedback from the community has been so positive and encouraging that the district brethren hope to participate again in 2018. There were approximately 30 attendees at the Open House event with eight members from the public. VW Bro Adan Taylor from Lord Duffering Lodge gave an audio-visual presentation, followed by question and answer session. The presentation was followed by afternoon tea and a chance to mingle and meet attendees. Open Day concluded a full week of the Lodge’s community engagement which involved participating in the Gympie Gold Rush Festival. We celebrated 150 years since establishment of Gympie and 148 years of Freemasonry in Gympie. A full page article about Freemasonry in Gympie and the Open Day was published in the Gympie Times. They have already received two nominations for initiation as a direct outcome of the activities, with a third possible to come. Master Masons are invited to attend a special lecture hosted by Barron Barnett Lodge on Wednesday 21 March 2018 7.15pm at the Ann Street Memorial Masonic Centre. 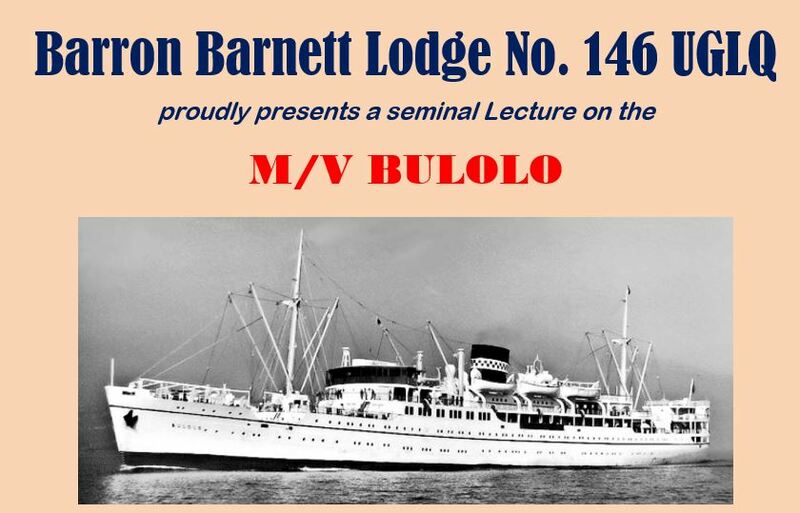 Travel back in time with Wor Bro Kevin Roberts, formerly of Madang Lodge No 380 UGLQ, as he recalls an important chapter of Australian maritime history when the Burns Philp fleet provided the link between Australia’s eastern seaboard and the myriad Papua New Guinea island ports; an era where Freemasonry held sway in our northern neighbour and aboard the interesting Bulolo, who morphed into a WWII Royal Navy Ship before returning to calmer pursuits. 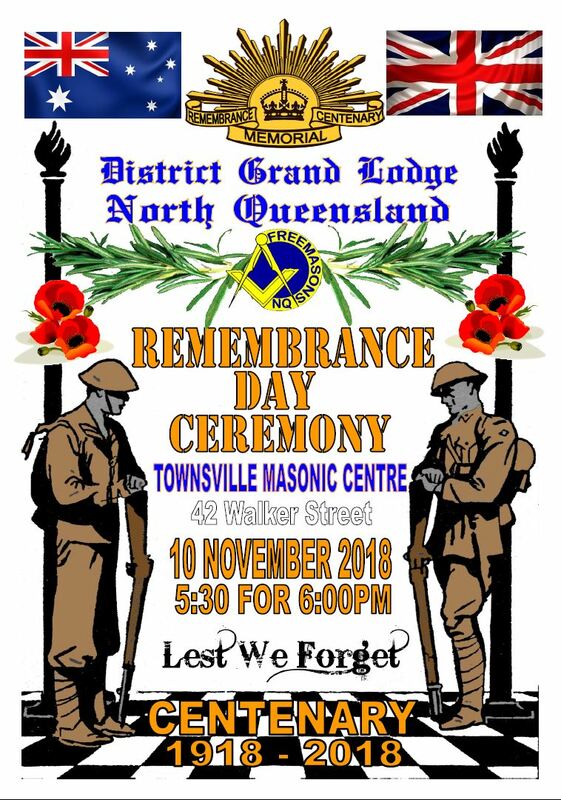 You are invited to attend a remembrance ceremony hosted by Northgate Remembrance Lodge on Friday 10 November 2017, 7pm at the Kedron Masonic Centre. 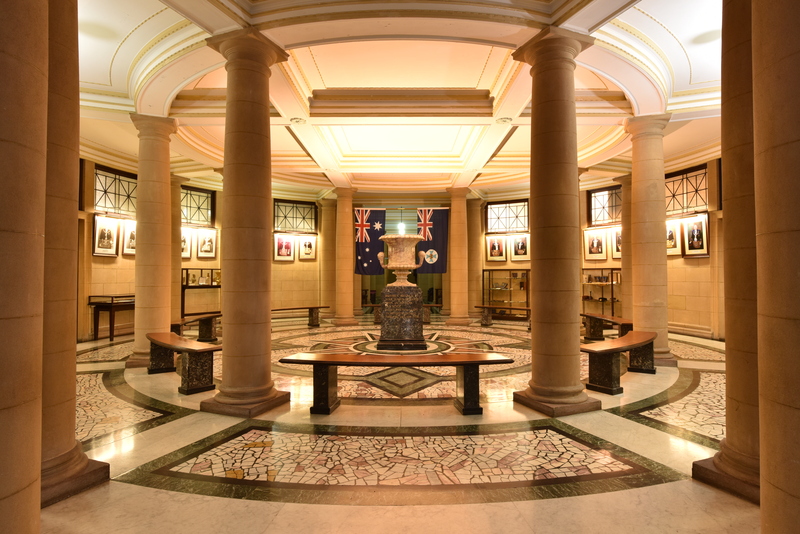 The ceremony will honour Freemasons who paid the supreme sacrifice for Australia as well as those others who served.